Ready for my grilled pizza surprise? This kid-friendly meatball pizza on the grill is fantastic for family dinners, picnics and cookouts. 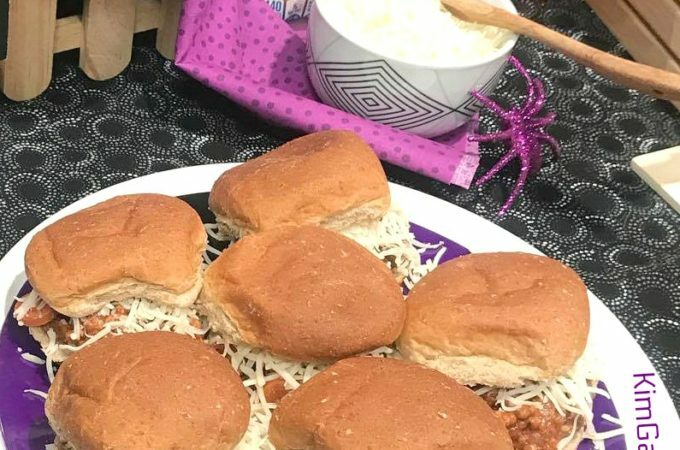 But as a dietitian, I’ll bet you think I’d say no to this kid-and-family-friendly meal. Wait! Wait! Hold on! Before you ditch your frozen pizza and stop ordering delivered pizza for family movie night, let me explain. No. It’s not junk food. Far from it. Doesn’t matter what kind, homemade, frozen or store-bought, it always contains at least three of the nutrient-rich food groups: grains (crust), dairy (cheese) and vegetables (tomato pizza sauce.) And by the way, I detest the term “junk food.” In my realistic dietitian book, no food is a junk food. Sure, some foods don’t give you the valuable nutrients you need to stay healthy. But all foods give you calories for energy and I prefer to call these foods treat foods, or fun foods (or non-nutrient-rich foods technically) because they give you satisfaction and happiness. A big piece of white cake with double white buttercream frosting is my favorite example. No real nutrient benefits but lots of satisfaction and happiness. Protein provider. 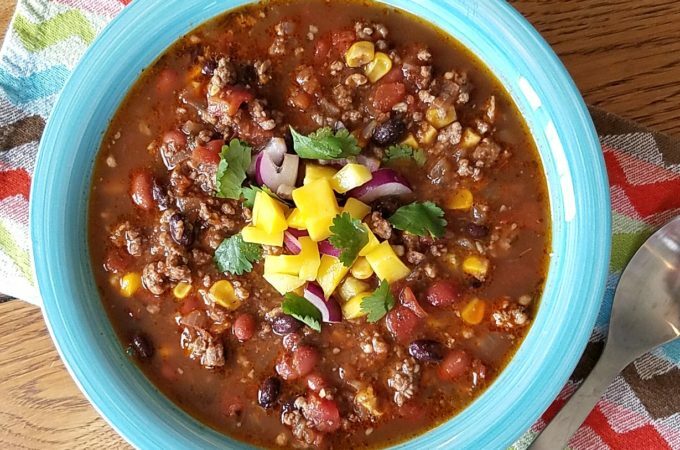 Whether from the meats or cheese, you’ll get plenty of protein. Whole grains. Or just grains in general from that crust. Remember – aim for at least half of your grains every day from the whole category, so it’s okay to enjoy white pizza crust. Or the whole grain crusts or dough. Your choice. More fruits and vegetables. Onion and green pepper are the most common veggies on a pizza. Pineapple (with ham which is naturally lean!) is the most common fruit. But shake things up and go for colored bell peppers, mushroom, spinach, arugula, carrots, squash (leftover garden zucchini anyone?) or any veggie you like. Peach and plum slices, apple slices, any fruit you want. Calcium. Cheese (any variety you want on this pizza) give you lots of bone- and teeth-building calcium. RQ. That’s “restaurant quality.” Your homemade grilled pizza is by far better than any you’d get at a restaurant because YOU made it! Here’s my favorite grilled pizza that combines TWO kid favorites – pizza and meatballs. 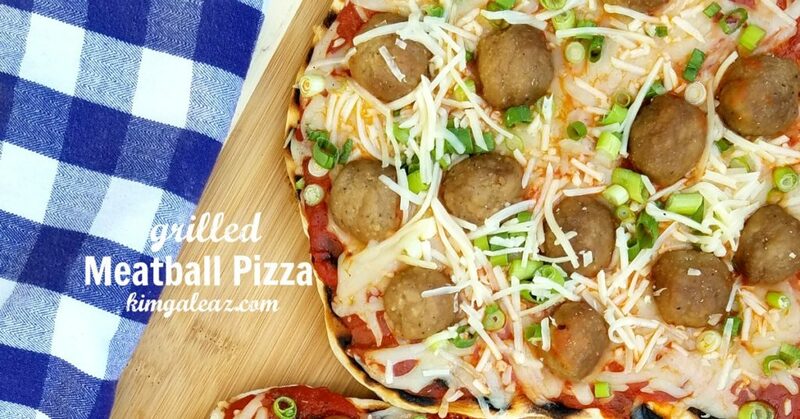 Kid-friendly meatball pizza on the grill for family dinners, picnics and cookouts. Divide dough in half. On a floured surface, roll into two 8-inch circles roughly. No need to create perfect circles. Oil grill grates and preheat grill to medium-low heat. 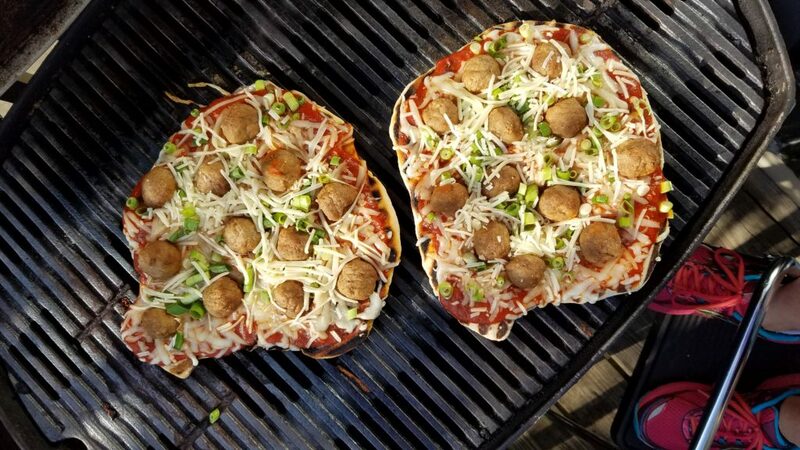 Place the pizza crusts directly on the grill grates. Close cover and cook 1 to 3 minutes or JUST until the dough puffs and bubbles up in some places and starts to become firm. Divide pizza sauce between both crusts and spread. Top with half the meatballs and green onion. Sprinkle each pizza with half the cheese. Return pizzas to grill, cover and grill for 3 to 6 minutes or until the crust is crisp (not burned!) and cheese is melted. Remove pizzas and cut into 4 slices each. Disclosure: As a proud supporter of Indiana Agriculture, I’m happy to mention this is a sponsored post for the Indiana’s Family of Farmers. And did you know Indiana’s dairy farmers rank 14th in the US for production? And the average American eats 31 pounds of cheese every year! That’s a lot of calcium and protein!